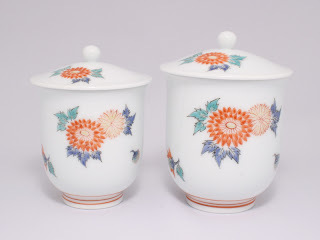 Kakiemon is very different from other porcelain because of its warm milk-while foundation called “Nigoshide”. Kakiemon’s Akae matches Nigoshide better than other white porcelain of Arita which is bluish, neat and cool. In the later Edo period (around 1800), however, the Nigoshide disappeared because of its difficult process of production. In Showa period (1925-1989) people who studied Kakiemon valued Nigoshide again and hoped for the reproduction of it. Thus Kakiemon XII and XIII combined their efforts and in 1953 succeeded in reproducing Nigoshide. Then the technique of Kakiemon-style was highly valued and designated as an important intangible cultural treasure of Japan in March 1971. Kakiemon XIV, who is alive today, learned a way of mixing paints and a technique of Akae directly from Kakiemon XII and the art of forming from Kakiemon XIII. He is doing his best to make up his own Kakiemon-style with a modern sense in a traditional technique. He was designated a Living National Treasure of pottery painting in July 2001.